Mack Crane Truck with 24525 on the meter. 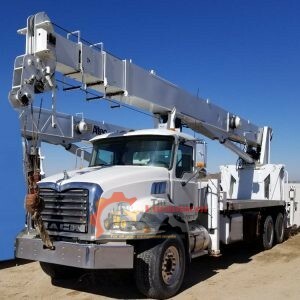 This unit has an Altec 26 ton crane that has a 103’ reach, and rear lockers as well. This truck runs and operates as it should and is ready for work! MT535B Challenger Tractor with a Cat C-7 engine, power shift Transmission with 10 gears, 1008 hours, 2 speed PTO, Tires in good shape. Has a Diamond Brush Mower (SN MF11004) attached to a 25′ reach boom, cuts a 4′ swath. Functions properly. Unit is good and clean and ready for work! 2015 CS44 Smooth Roller with Pad Shell Kit. Leveling Blade, 66” drum, Enclosed Cab, GPS. 256 Hours, Everything works. 2015 Caterpillar 305e Mini Excavator, 3 buckets (1 muck, 2 dig) and compactor. 1728 Hours, Everything Works. Hour Meter Reads 11347, Swing boom, Esco Grapple, U/C @ 80%. In running condition, and working daily. 1999 International 4700 4X2 Glass Delivery Box Truck. This Truck was Fleet Owned and Maintained on regular intervals. Meter Reads 299116, DT466 Engine rated at an estimated 260 HP, 5 speed Automatic Transmission. The Box is set up to haul and Install sheet Glass. It comes with a Work bench, Glass Hauling Brackets and a loading ramp. The Truck, Engine and Trans are in good working order with no visible leaks. Tires at 60%, hour meter reads 3312 hrs, new cutter bit. Good running Loader with no known issues. Set up with 622 Waratah Processing Head, all in good running and functioning condition. 18637 on the meter. 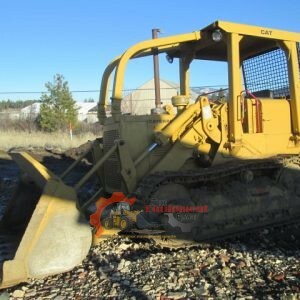 Undercarriage is in good shape, machine is in good overall condition, runs great, and is in the woods working daily. Original Hour Meter read 3086 when it was swapped out, and the new meter currently reads 76 hours. Sweeps, rear screen, New U/C, new tracks, no leaks, no issues. This machine is in excellent condition and ready for work.